Every year the kids and I made sugar cookies for Christmas. It was great fun and our family tradition. I would make the dough and the kids would help me cut out the shapes and decorate them with colored sugars. They were so pretty and we always left some on a plate for Santa. But as the kids grew older, they started to lose interest in our cookie making sessions. Then one year, there I was making and decorating 7 to 8 batches of sugar cookies, well into the night – all by myself. Then I had a brilliant idea. 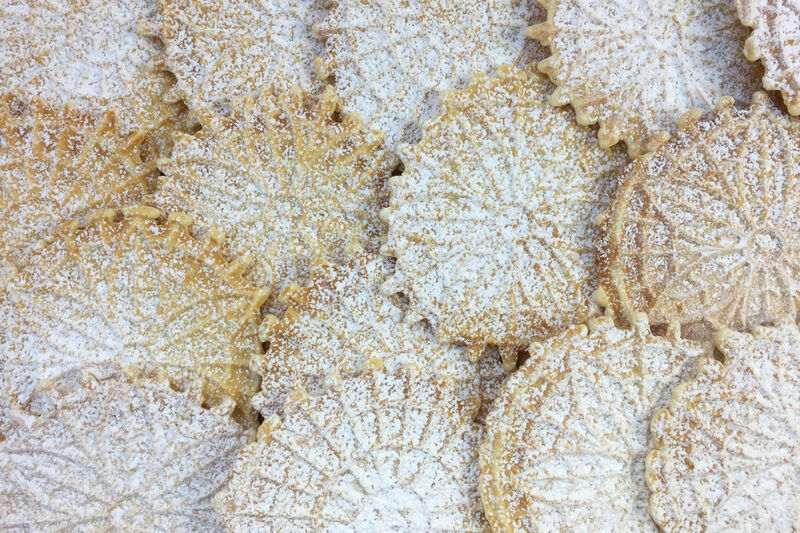 Why not make homemade pizzelle instead for Christmas. They are festive looking for the holiday season and soooo much easier. Yes, my idea was a good one. 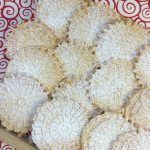 These pizzelle cookies are beautiful and delicious and have become part of our new family tradition. 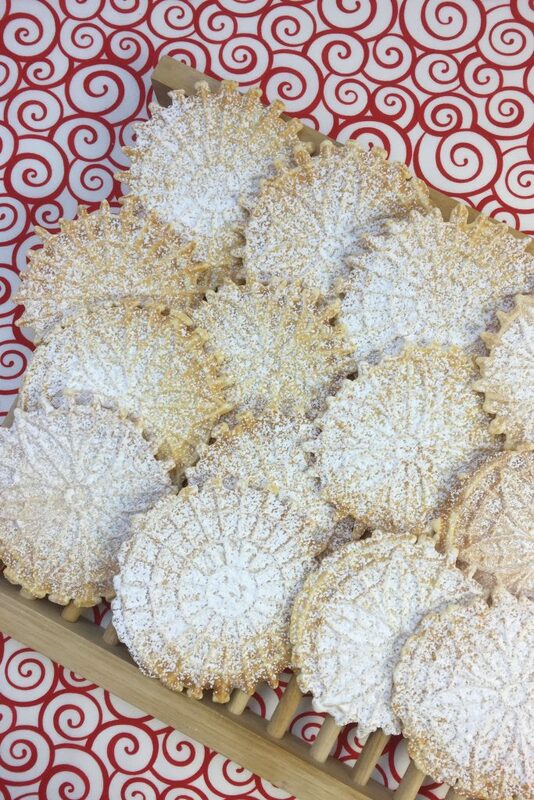 Now, you may be thinking that you can find pizzelle in any grocery store. You probably have seen them. They come in a clear plastic container and are usually found in the bakery department. I admit that they look nice, but I promise you, the flavor does not even come close to homemade. 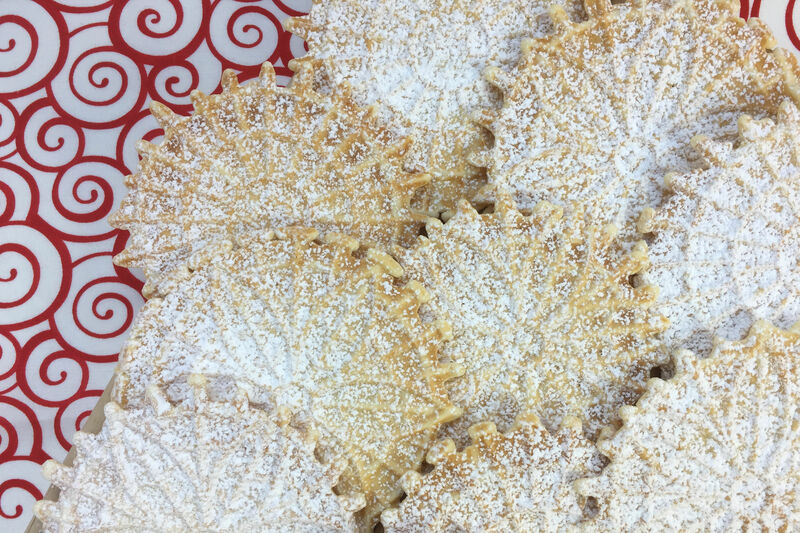 Homemade pizzelle are on a whole different level. And you can flavor them anyway you like. I like the traditional Italian version which is made with Anise but you could use a vanilla, orange, rum or almond extract. You can even make a chocolate version which is definitely on my “to do” list. 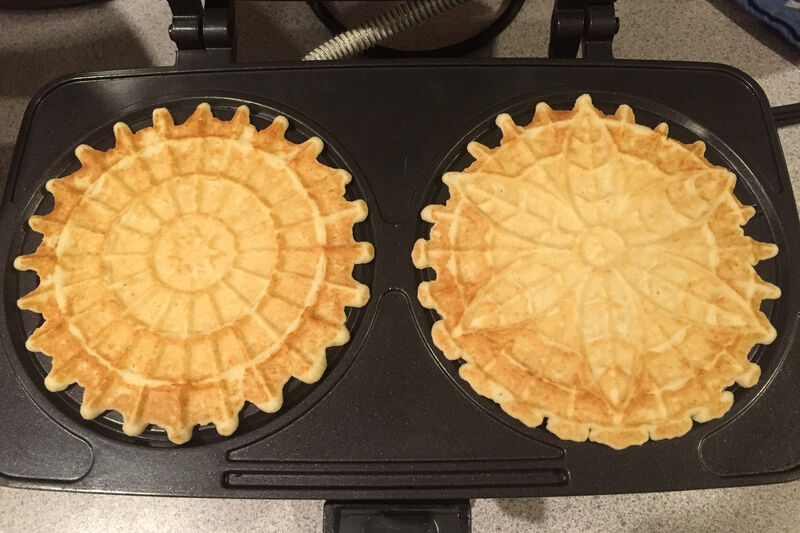 These are easy, easy, easy to make but you do need a pizzelle maker. If you do not already own one, you may want to put one on your wish list. The batter is simple and comes together in about 5 minutes. Then it only takes about 30 seconds to “bake” each one. You literally can be eating your first pizzella within 10 minutes! Mise en Place - Measure out all of the ingredients. 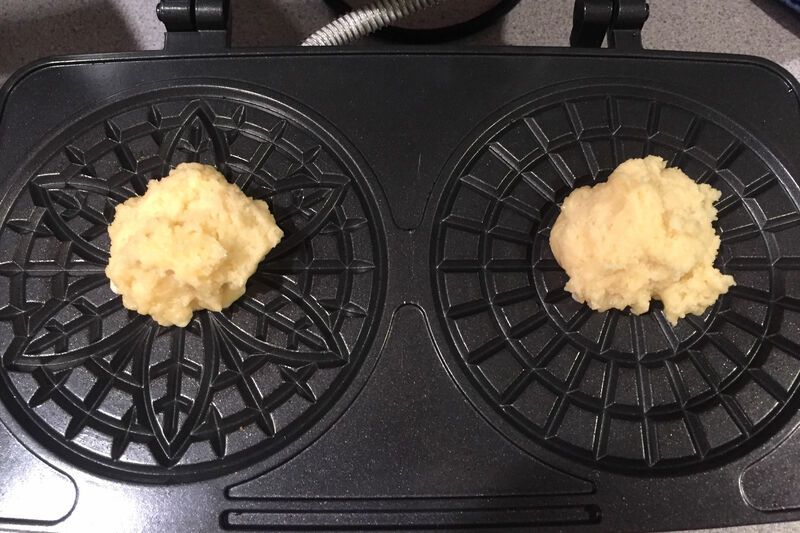 In a small bowl, melt the butter in the microwave. Set aside. In a large bowl, whisk the eggs, then whisk in the sugar and the anise extract. Stir in the cooled, melted butter. Sift in the flour and the baking powder. Mix all together with a wooden spoon until you have a smooth, thick batter. * You can use an electric mixer if you prefer. Spoon out about a heaping tablespoon of batter into the center of the engraved pizzelle design. Close the cover of the iron and cook for about 30 seconds. You are looking for a light golden brown. You will have to experiment a bit with the timing and amount of batter needed to make an attractive pizzelle. Lift the cover and carefully with a fork, remove the pizzelle and lay flat on a cooling rack. Continue to make the pizzelle. Later dust with confectionery sugar if desired. Store cooled pizzelle in a tin or wrapped in foil. 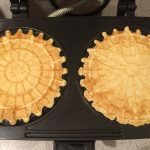 It is important to follow the manufactures instructions for the particular pizzelle iron that you are using, as they may be slightly different from the one I use. I have a "Chef's Choice" that makes two 4¾" pizzelle at a time. 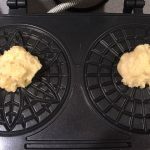 It is "nonstick" and does not require spraying oil on the iron plates. The instructions below work great with my pizzelle maker and should be somewhat similar to the instructions with yours. Some pizzelle irons require you to spray some cooking oil on the plates, in order to prevent sticking. If you would like a thinner or more delicate pizzelle, add a little water to the batter to thin it out a bit. Do not get hung up on making the perfect looking pizzelle. Each one will be a little different which is part of their charm.